Eating healthy doesn’t always come naturally, usually it’s comfort food that feels like a more natural go-to. It fills us up and it’s easy. But if you’re trying to eat better, than comfort food defeats the purpose. Unless you can make it more healthy and not taste the difference. There are plenty of awesome sources that will give you great references on how and what you should eat so you can lose weight and be healthy. There’s no need to go on a boring diet, all you have to do is swap out the good tasting unhealthy foods for good tasting healthy foods; it’s as simple as that. I don’t always like to sub things out, but when you give me the right options, I’m pretty happy. Eating healthy gets easier when you find the right ingredients and snacks that don’t make you feel like you’re missing out. That’s one of the tricks to losing weight and Cosmopolitan gives some awesome tips on doing just that. Here are a few of them. Combine 2 carbs to make a complete protein: I had no idea that this was something you could do, but I’m definitely trying it out now. “Butter” your toast with avocado: I’ve done this plenty of times and it tastes so good! It’s easy and more filling than just putting butter on your toast. Use a full-fat dressings: Eating healthy fats from things like olive oil (which you can find in vinaigrettes) helps your body take in more of the nutrients from the produce you eat. This is proof cutting out fats all together isn’t a good thing. Take a look at the other healthy eatings tips from Cosmopolitan here! Buzzfeed found some awesome charts for eating healthy that you should definitely look over and save. And this one is great; we all want to eat healthy, but when healthy is made quick and easy, it just gets better. Check out the rest of the awesome charts here! Prepping for meals on a busy week is the best thing you can do to ensure that you don’t end up in the drive through lane at McDonald’s. It really is great to get things finished so you can relax and eat healthy everyday. For instance, you can prep multiple slow-cooker meals at once and freeze them in bags. Once you’re ready to use them, just let them thaw overnight in the fridge, and put it in the slow-cooker for dinner later on. Check out this meal prep idea and others from Buzzfeed here! Sometimes eating healthy can be boring and repetitive (which is why most of us give up on it after a week). But when we can find ways to eat better without even noticing, then suddenly it becomes apart of the normal way of eating. We don’t have to think about it because it’s suddenly natural and easy to do. That’s why I really appreciate this list of ways to do portion control so you don’t overeat or have to measure everything out (because who has time for that?). 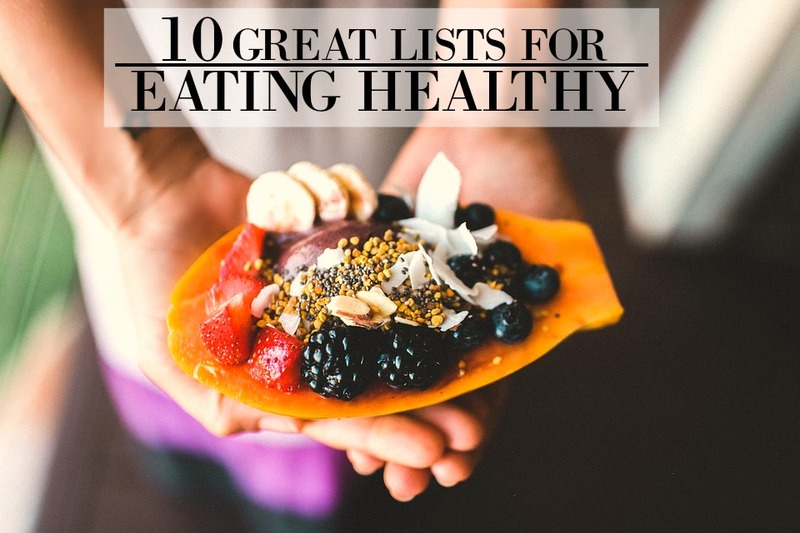 Read more great ways on eating healthy without even noticing here. Detoxing is one of the essentials of eating healthy. It means you can get rid of toxins from your body and lose weight through boosting your metabolism. So eating foods like avocados, apples, kale, green tea, grapefruit, and even garlic can deliver antioxidants to your system and provide you with the nutrients you need to lose weight and feel great (wasn’t trying to rhyme there). Read more on awesome detoxing foods here! Protein and good fats are everything (well almost) when it comes to working out. They provide you with the right kind of calories you need to workout and build muscle (muscle also burns fat… just so you know). Also, Buzzfeed provides a list of ways you can start eating healthy meals for specific types of workouts. So for instance.. If you’re a weightlifter or do short high intensity workouts, you’ll want to eat less carbs and more proteins and fats. But they also go into the simple facts of how and when you should eat if you want to burn those calories and be healthy. So if you eat small before a workout you won’t be working out on a heavy stomach. And you should make sure to eat an hour before you workout so you give your body time to digest the food (also, eating after working out helps burn the calories from the food faster than if you ate before). Check out more workout meal tips here. Snacks are great, and if you want to snack and not gain weight, then this list is full of awesome recipes you can make to do just that. So instead of a bag of “healthy” (*cough* deep fried *cough*) veggie chips, you can make yourself things like Strawberry Cheesecake Chia Seed Pudding, Apple Sandwiches with Almond Butter and Granola, or High Protein Fruit Dip with Sliced Apples (I’ve tried that last one, and I personally approve; it’s really tasty). Take a look at the rest of these awesome high-protein snack recipes here! Some of us actually like eating fruits and veggies! And some of us don’t. That’s why there are a few hacks you can apply so you start eating healthy.. and don’t mind it. You can toss some spinach into a non-green smoothie and you’ll never know it was there. Seriously, I’ve done this and couldn’t see or taste a thing. Or use lettuce for a wrap instead of an actual wrap. I’ve also done this before and I could only taste the yummy filling, the lettuce didn’t come through at all. Check out more easy healthy recipes here! I love bacon and I loved it before it was trendy to put it on everything (I swear I’m not a hipster). And this is why I love this post. If I can stick to eating healthy (or healthyish) and still eat bacon, then that’s awesome. And these recipes like Loaded Bacon Sweet Potato Skins, Bacon Wrapped Chicken Breast Bites, and Zucchini Noodle Carbonara all look so good. Take a look at the rest of their awesome bacon recipes here! Slow cooked meals are the best, especially since I’m a blogger; I don’t always have the time to cook complex and long meals when I’ve been working hard all day. And these slow cooker recipes that keep you eating healthy but allow you to be lazy are great. Their recipes like Hawaiian Pork Burrito Bowls, Chicken Fajitas, and Black Bean, Butternut Squash, and Quinoa Chilli look mouth watering. Take a look at the rest of their healthy slow cooker recipes here! Finding the right meal plans and ingredients to make tasty and healthy meals doesn’t have to be a hard task. Usually all we need is a little help to get started in the right direction and pretty soon eating healthy becomes the natural thing. Now it’s your turn! If you have any awesome easy and healthy meals, email me or let me know in the comments below. I’d love to see what you’ve got!